Fixing Those Soldering Iron Woes – LEARN • CREATE • BE HAPPY! Every now and then we get a call about a customer’s Studio 100 Soldering Iron not getting hot enough. We go through the standard questions like where did you purchase your iron, when did you purchase your iron, is there any damage to the cord, are you using a Studio Pro Tip, and the one that surprises everyone … What condition is your tip in? 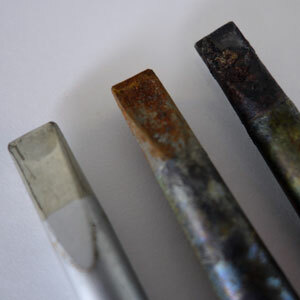 Believe it or not, the most common cause for any soldering iron “not getting hot enough” is the condition of the tip. If a tip becomes oxidized or rusted it can no longer transfer heat which will make it seem like your soldering iron is not working. Check out this article for ways to fix your tips or better yet, prevent damage. Cord damage, while not as common as damage to the tip, can be brutal and no amount of electrical tape can fix it. However, there are some basic steps you follow to prevent damage. Do not pull the cord to unplug the iron, pull from the plug. Use a stand when working on a project to prevent the iron from accidently rolling into the cord. Wait until the iron is completely cooled until you put it away. The Studio 100 Soldering Iron has a built-in temperature control so it is very important to use a soldering iron tip that works with the built-in temperature control. Our Studio Pro Soldering Iron Tips are specifically designed to be used with our Studio 100 iron. Each tip has a temperature controlled magnet that when engaged with the soldering iron, produces the correct temperature. If you are using a soldering iron tip that does not have such a magnet, your Studio 100 will not transfer heat properly. For more soldering tips, stop by the Creative Corner. Got a tip you’d like to share? Share your favorite tips in the comments section!